I've already owned a few eyebrow pencils but what makes me wanna get the Witch's Pouch Get It Dual Brow Pencilcara is because of the two-in-one multi function! Normal eyebrow pencils have pencil sides with a normal screw brush, but the Pencilcara has brow pencil + browcara together which is super convenient to use and bring along! The Pencilcara is created for us to create a natural brow makeup without any special techniques needed. Besides, it's WATERPROOF! The brow pencil is an Auto Triangle Pencil which makes it easy for you to draw your desire brow shape in any angle. The shades available are rich brown (#1) which is to match your dyed bright hair colours, and natural brown (#2) that to match natural hair colours. I'm not sure why I picked #1 but I know that I need #2 cause I don't have light hair colour. Too bad, my mistake. I'll just have to go with a fancy brow colour. Haha. The rich brown (as swatch in image above) is a bright and polished light brown in caramel colour, whereas the natural brown is a dark natural brown of chocolate colour. As seen from the image above, the brow pencil is not really easy to give dark colours. It's great to create a natural brows lightly if you're not going for the browcara colours that day. The browcara's colour is really pigmented and vibrant! The texture is not thick but it's a little bit creamy, which you can tell it's really a waterproof quality product after it drys up! Now let's check the waterproof test! Result: The colour still stays the same on my hand! And I did try to lightly rub it and it doesn't smudge at all! Use the brow pencil to draw the browline to achieve your desire brow shape, then fill in the inside with care. Then, apply the browcara along the brows. Comparison between my original eyebrows with only brow pencil. Comparison between my original eyebrows with brow pencil + browcara. 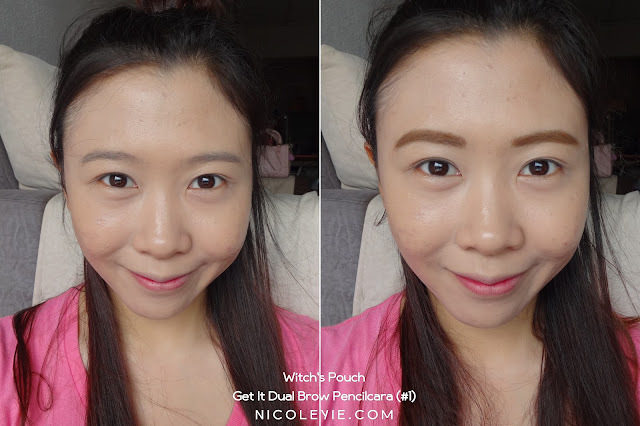 Comparison between only brow pencil with brow pencil + browcara. Both sides with brow pencil + browcara. Before and After using the Get it dual brow pencilcara. I love the browcara very much, despite that it's not the colour that I want! I really love that it's easy to be applied on my brows and gives a really intense colour! The description actually says the brow pencil has creamy texture but it's not creamy at all, but at least it's able to give out a natural colour (and at least it suits my hair colour haha). And what I love the most is that it's waterproof! Now I can wear it to any beach trip and snorkel all my way already! 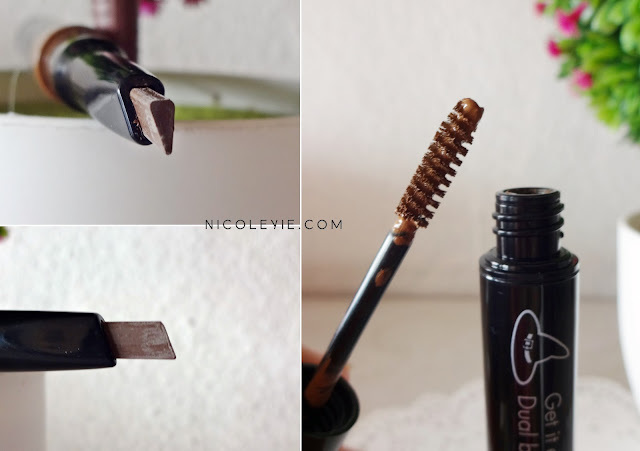 So have you used any similar eyebrow products? Share with me in the comment section below! I would love to try them in the future!